Great location, clean nice apartment, thank you! This elegant apartment, in a recently renovated building of holiday rental apartments, can be found in one of the most popular neighbourhoods of Barcelona, the Eixample district. It is very conveniently located right in the city centre, ideal for those looking to enjoy all that the Catalan capital has to offer. The apartment is only a 10-15 minute stroll from some of the most well-known streets and best attractions in Barcelona, such as Passeig de Gràcia, Plaça Catalunya and Las Ramblas. There are plenty of great restaurants, bars and cafés in the area, plus many supermarkets nearby. You can easily reach other parts of the city and the suburbs via public transport from the apartment, as there are two metro stops and several bus stops close by. This superb apartment has 2 bedrooms and 2 bathrooms, allowing up to 6 guests in total to stay here. There is one double bedroom (made from two single beds) and another with two separate single beds. There is also a double sofa bed in the apartment.One of the modern bathrooms has a shower-bathtub combination, while the other has a massaging shower stall. What´s more, there´s even a communal terrace with tables, chairs and sun loungers for you to enjoy. The kitchen in this air-conditioned apartment comes fully-equipped with all the appliances and utensils you´ll need to prepare your favourite meals. 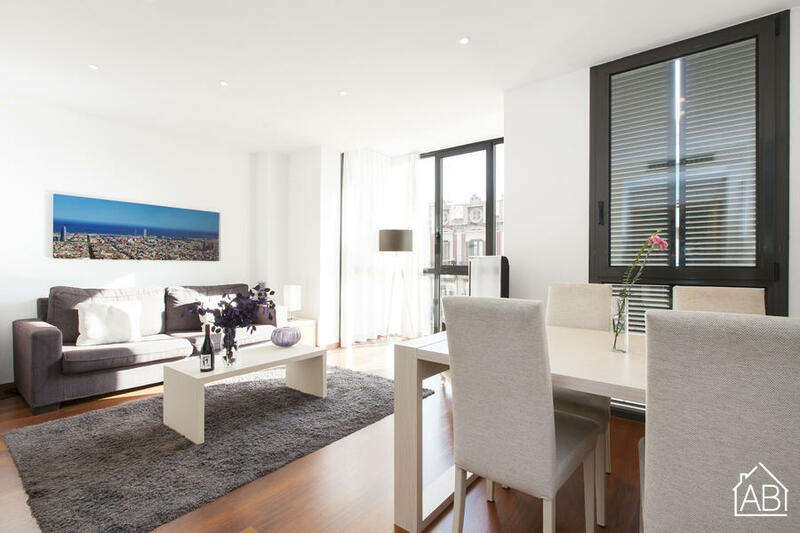 There are plenty of modern amenities in this luminous apartment, such as a washing machine, dishwasher, free WiFi and a flat-screen satellite TV, making this a fantastic choice for your home-away-from-home in Barcelona. The apartment block has a reception, open 09h-18h weekdays.